Hello Everyone! I hope you all had a nice holiday. I had a great time. We stayed with my in-laws for 3 days and it was a lot of great food and fun. This morning we had a slow start back to school and I had to drive Nicholas’ lunch to school which I somehow forgot to pack in his bag! 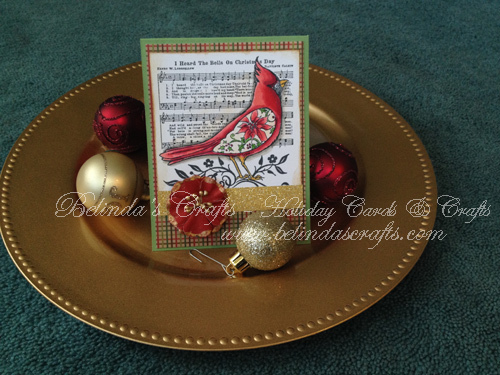 So I thought it might be fun to have my very own 12 days of holiday cards and crafts for this blog. So today is day one and I made his card using a Stampendous stamp that I have had for way too long without using it. I made a top-folding card and used Stampin Up Cardstock for the base and I cut a strip of glitter paper for more sparkle. The flower is from the dollar bin at Michael’s. I used a Flourishes stamp for the greeting inside. 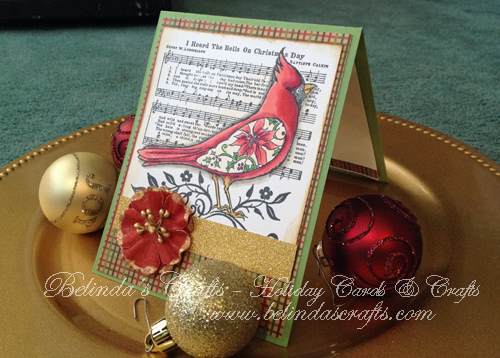 I just love birds and Cardinals are one of my favorites. I just had to have this stamp when I saw it. I also love that the sheet music was part of the image too. Very cool. So I used a little Distress ink to age the paper a bit. 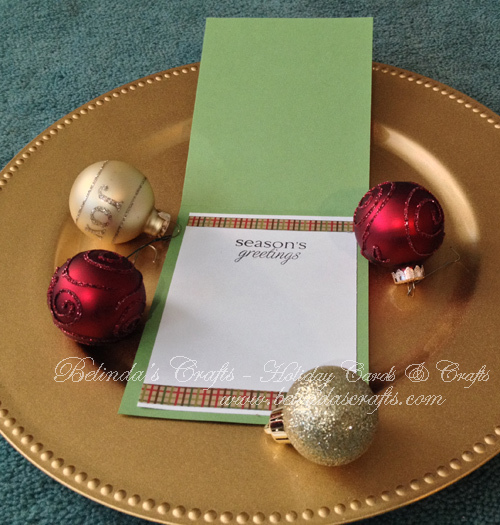 My props were super easy: Dollar store plate and some ornaments I use on my mini tree I put up in my craft room. I hope you are all having a blessed day and keep on crafting! Love it! It is so pretty!! !